Today, you are a member of... Velocipedic Victory - You Are A Member! Those nutty Victorians. They didn’t need spandex to have an athletic good time. They just needed the open road and new gadget. 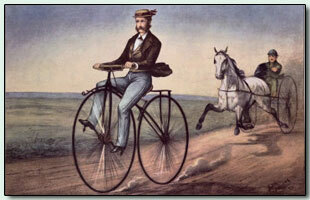 Only after such novelty became sport did uniforms evolve, making the “man on a bike” a bicyclist. The key to having a velocipedic good time in the coming week is figuring out whether you are uniformed or not. Look down. Do you see a competitor with corporate sponsorship or an entertained amateur on a lark? Either way, you seem to be pulling ahead of your challengers, so maintain consistency: feel the burn or dandy out, but don’t switch attitudes mid-race.